Art Nouveau Inkwell and letter opener by Maurice BOUVAL. In the shape of a young girl holding an inkwell of water lily leaves with a small lid surmounted by a bee in high relief comes with letter opener with similar girl to make a set Both Signed M.
Collin & Cie" and "Paris Inkwell : 11 x 21.5 x 16 cm, letter opener : 22 cm Similar piece is in collection of Musée d'Orsay in Paris. Sculptor and pupil of Alexandre Falguière. His main works are in the Muesum. He participated in the 1890 Exposition Universelle in Paris and. Was a member of the Société des Artistes Français. Please study my photographs carefully. 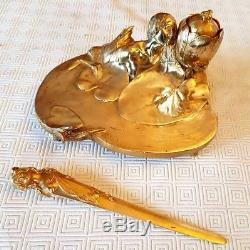 The item "Muesum Quality BOUVAL Art Nouveau Inkwell letter opener Gold bronze statue 19th" is in sale since Monday, October 8, 2018. This item is in the category "Antiques\Periods & Styles\Art Nouveau". The seller is "atoesa" and is located in Valkenburg LB. This item can be shipped worldwide.